Mrs. Hazel Inez McCurley Hufstetler, age 84, of Cartersville, GA passed away Monday, September 3, 2018 in a Cartersville nursing center. She was born in Cherokee County, GA on July 28, 1934 a daughter of the late Roland D. McCurley and Sarah Leone Anderson McCurley. 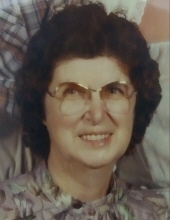 Mrs. Hufstetler had lived the greater part of her life in Cartersville where she was a member of the Zion Hill Baptist Church. She retired from Spring City Mill with nearly 30 years of service. Mrs. Hufstetler enjoyed quilting, gardening and working in her flower garden. In addition to her parents she was preceded in death by her husband, John Willie Hufstetler on June 19, 1998; by three brothers: Hollis, L.D. and Jack McCurley and by a granddaughter, Lashe Burch Shepard. Survivors include two daughters: Sandra Burch (Gary Barnette), Cartersville and Charlene Lewis (Bobby), Taylorsville; son, Jerry Hufstetler (Kellie), Adairsville; two sisters: Dollie Curtis, Marietta and Thelma Gable, Acworth; 10 grandchildren, 17 great grandchildren and numerous nieces and nephews. Funeral services will be held Thursday, September 6, 2018 at 1:00 pm in the chapel of the Alvis Miller & Son Funeral Home with Rev. Floyd Hufstetler officiating. Interment will follow in Sunset Memory Gardens, Cartersville. Grandsons serving as pallbearers will include: Jeremy, Todd and Tanner Hovers, Tony Amos, Justin Hufstetler, Joey Lewis and John Burch. The family will receive friends Wednesday evening from 6 until 9 pm at the funeral home. The Alvis Miller & Son Funeral Home is in charge of arrangements for the funeral of Mrs. Hazel Inez McCurley Hufstetler. To send flowers or a remembrance gift to the family of Hazel Inez McCurley Hufstetler, please visit our Tribute Store. Interment will follow in Sunset Memory Gardens, Cartersville, GA.
"Email Address" would like to share the life celebration of Hazel Inez McCurley Hufstetler. Click on the "link" to go to share a favorite memory or leave a condolence message for the family.